First novel, worldwide bestseller. Number 1 UK, number 10 USA. Sold over a million copies in those two countries alone. Curtis Carroll Davis, THE BALTIMORE SUN. Michael P. Teal, TRIBUNE, SOUTH BEND. Gary Morgan, THE DENVER POST. "KG200 takes the reader through a believable, gripping saga of mystery and intrigue, before its unexpected end.."
"What history can't tell us is the information the authors have assembled about a facinating aspect of the war. Its a lot like "The Eagle Has Landed" and just as well written and enjoyable.."
Grady Long, THE CHATTANOOGA TIMES. "The story expodes to an exciting climax...superb suspense.."
Virgil Miller newton Jnr, THE TAMPA TRIBUNE. "This powerful and original book...its skillful combination of what actually happened and what might have happened.."
Dan Lees, WESTERN DAILY PRESS. 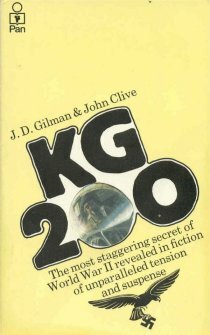 "An excellent suspense novel, KG200 by J.D Gilman & John Clive"